The infiltration rate is the velocity or speed at which water enters into the soil. It is usually measured by the depth (in mm) of the water layer that can enter the soil in one hour. An infiltration rate of 15 mm/hour means that a water layer of 15 mm on the soil surface, will take one hour to infiltrate. In dry soil, water infiltrates rapidly. This is called the initial infiltration rate. As more water replaces the air in the pores, the water from the soil surface infiltrates more slowly and eventually reaches a steady rate. This is called the basic infiltration rate (Table 7). The infiltration rate depends on soil texture (the size of the soil particles) and soil structure (the arrangement of the soil particles: see Volume 1) and is a useful way of categorizing soils from an irrigation point of view (see Table 8). The most common method to measure the infiltration rate is by a field test using a cylinder or ring infiltrometer. Ring infiltrometer of 30 cm diameter and 60 cm diameter. Instead of the outer cylinder a bund could be made to prevent lateral water flow. Hammer the 30 cm diameter ring at least 15 cm into the soil. Use the timber to protect the ring from damage during hammering. Keep the side of the ring vertical and drive the measuring rod into the soil so that approximately 12 cm is left above the ground. 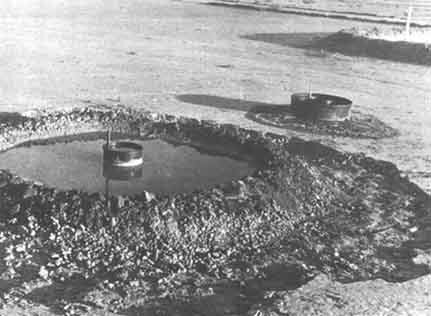 Hammer the 60 cm ring into the soil or construct an earth bund around the 30 cm ring to the same height as the ring and place the hessian inside the infiltrometer to protect the soil surface when pouring in the water (Figure 75). Start the test by pouring water into the ring until the depth is approximately 70-100 mm. At the same time, add water to the space between the two rings or the ring and the bund to the same depth. Do this quickly. The water in the bund or within the two rings is to prevent a lateral spread of water from the infiltrometer. Record the clock time when the test begins and note the water level on the measuring rod. After 1-2 minutes, record the drop in water level in the inner ring on the measuring rod and add water to bring the level back to approximately the original level at the start of the test. Record the water level. Maintain the water level outside the ring similar to that inside. Continue the test until the drop in water level is the same over the same time interval. Take readings frequently (e.g. every 1-2 minutes) at the beginning of the test, but extend the interval between readings as the time goes on (e.g. every 20-30 minutes). Note that at least two infiltration tests should be carried out at a site to make sure that the correct results are obtained. Table 8 and Figure 76 show how to record these measured data. Column 1 indicates the readings on the clock in hours, minutes and seconds. Column 2 indicates the difference in time (in minutes) between two readings. Column 3 indicates the cumulative time (in minutes); this is the time (in minutes) since the test started. Column 4 indicates the water level readings (in mm) on the measuring rod: before and after filling (see step 5). Column 5 indicates the infiltration (in mm) between two readings; this is the difference in the measured water levels between two readings. How the infiltration is calculated is indicated in brackets. Column 6 indicates the infiltration rate (in mm/minute); this is the infiltration (in mm; column 5) divided by the difference in time (in minutes, column 2). 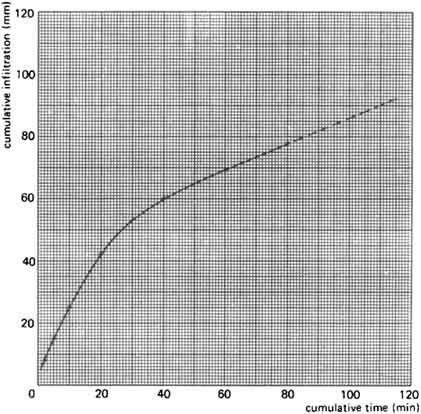 Column 7 indicates the infiltration rate (in mm/hour); this is the infiltration rate (in mm/minute, column 6) multiplied by 60 (60 minutes in 1 hour). Column 8 indicates the cumulative infiltration (in mm); this is the infiltration (in mm) since the test started. How the cumulative infiltration is calculated is indicated in brackets. 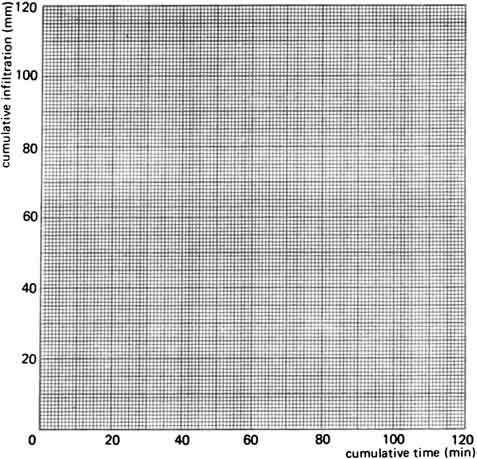 In Figure 76, the cumulative time (in minutes, column 2) is set out against the cumulative infiltration (in mm, column 8) and a curve is formed. From Figure 73 it can, for example, be observed that for the soil type used in the example it takes 70 minutes to infiltrate approximately 74 mm of irrigation water. The basic infiltration rate can be determined from Table 8, column 7: the infiltration rate in am/hour. Once the values of the Infiltration rate are constant, the basic infiltration rate has been reached. In this example the basic infiltration rate is 27 mm/hour and was reached after 60 minutes. After 60 minutes the cumulative infiltration was 69 mm. After the first 60 minutes the infiltration rate is constant: 27 mm/hour. So after 120 minutes (2 hours) the cumulative infiltration will be 69 + 27 = 96 mm (indicated on the graph with a dotted line). After 3 hours the cumulative Infiltration will be (96 + 27 =) 123 mm, etc. Once the curve has been established it is possible to determine how long it will take to infiltrate a certain amount of water. This is of course important to know when determining the irrigation time. Note: The infiltration curve should be determined for normal soil moisture conditions before irrigation takes place, i.e. usually when the top soil is dry.